Scalloped Creamed Potatoes is a comfort food my family has made for decades. The recipe comes from The New Antoinette Pope School Cook Book and was a professional cooking school in Chicago where my mom took classes during the 40s and 50s. 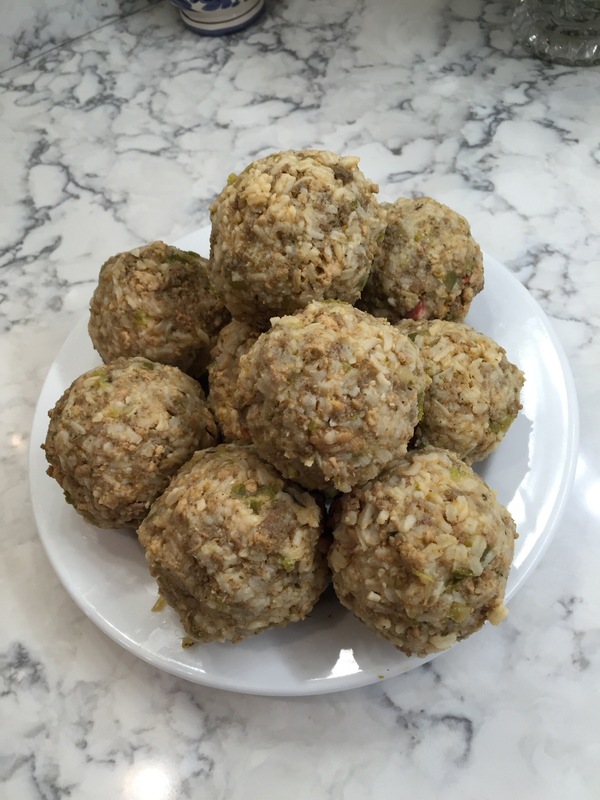 It’s a favorite to make a double batch for during the holidays when we have a group of 8 or more and want to have enough for at least 2 meals. The recipe uses Velveeta cheese because it melts so well. The original used American cheese. The Antoinette Pope School Cook Book was published in 1948, and again in 1953, 1961 and 1973. Velveeta was prolific then! slowly whisk in the hot milk and bring to a simmer. lower temperature to 300 degrees and remove cover. My Baked Macaroni and Cheese recipe is very similar. It uses the same cheese sauce and the recipe comes from the same cookbook! Look above under Recipes, then Sides for Baked Macaroni and Cheese. Posted in side dishes, vegetables and tagged Velveeta. Bookmark the permalink. Food & Wine Magazine published this as Catalan-Style Spinach. It’s very light with a sweet and crunchy bite! This serves 8 generous portions using 40 oz raw spinach! Posted in side dishes, Soups and Stews and tagged Barcelona, catalan, food & wine magazine, Pine nuts, spinach. Bookmark the permalink. These little cherry size tomatoes are spooned over toasty bread spread with labneh, a soft yogurt cheese. You can find that recipe here too! I found these little gems at our local farmers market. It’s the end of October in mid Michigan and we’re seeing the last of the vine ripened tomatoes, so it’s time to roast two batches for the week. These picture are of a double recipe! Toast your sourdough or other crusty bread. Spread with soft goat cheese or labneh. Spoon the tomatoes on top. Drizzle with a thick aged balsamic vinegar. Wilted sweet vegetables ready to eat! Scrape all the liquids and leftovers into a storage container. Use a rubber spatula to get every drop! Posted in side dishes and tagged bruschetta, Labneh, roasted tomatoes roasted onion and garlic, roasted vegetables. Bookmark the permalink. 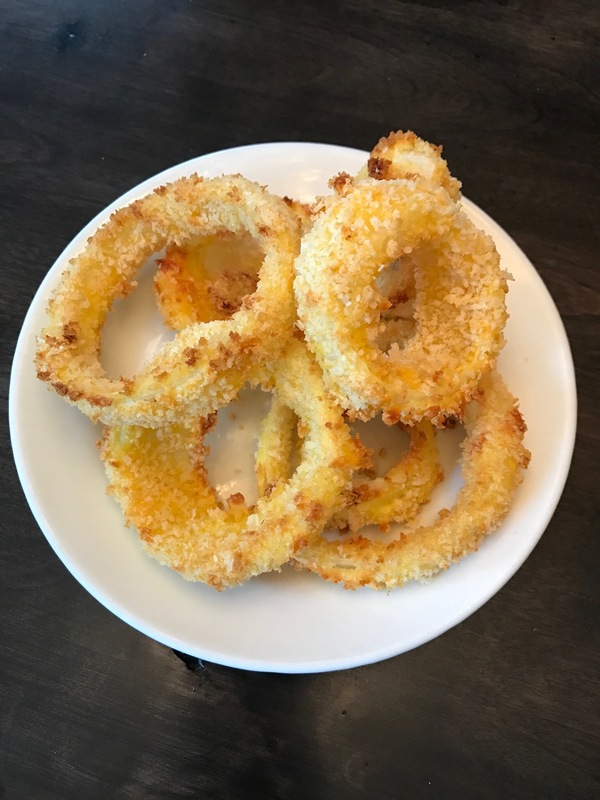 We love restaurant style onion rings! The whole fresh made rings are best. The chopped onion version is not as good. Too bad they have to be deep fried and are so greasy! But now you can make home made crispy onion rings without all that fat and mess! 1 large white onion, about the size of a softball! Slice the onion horizontally into 4 even slices, about 1/2-3/4 inch wide. Slice carefully so the rings stay together. Place the buttermilk in a medium bowl. Add the onion rings and let sit 30 minutes. Mix around a few times. While the onions marinate get your Ziploc bags ready. Add half the onion rings to the bag of flour, zip closed and mix around well. Shake off ﻿the excess egg and place the onion rings in the breadcrumbs. Close bag and mix around until coated. 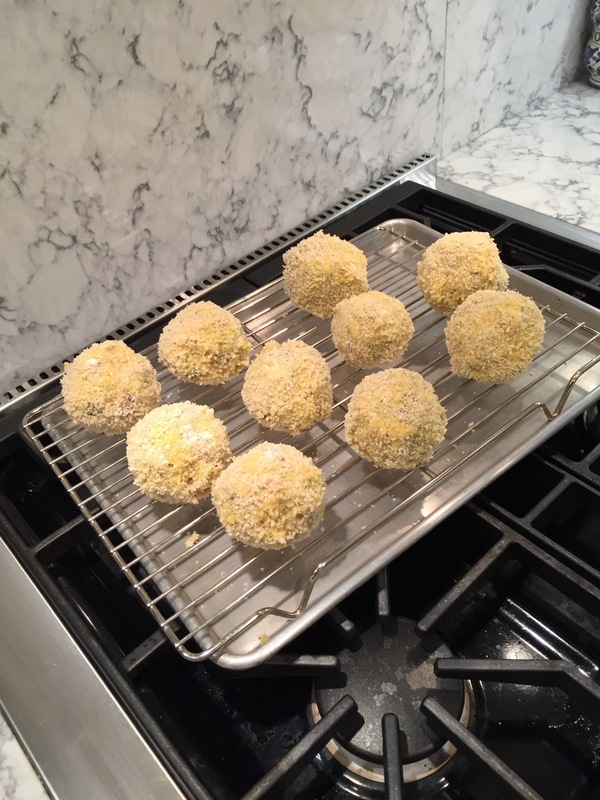 Place the panko coated onion rings on a parchment paper lined baking sheet. Repeat with the other half of the onion rings. Place the smaller rings and inner center pieces inside the larger rings so they all fit in one baking pan. Bake at 375-385 degrees for 30 minutes. The onion rings will be lightly browned. If the oven is too hot they will blacken or brown too quickly! Posted in side dishes and tagged crispyonionrings, lowfatonionrings, midcenturyfood, onionrings, pankobreadcrumbs, ziplocbags. Bookmark the permalink. 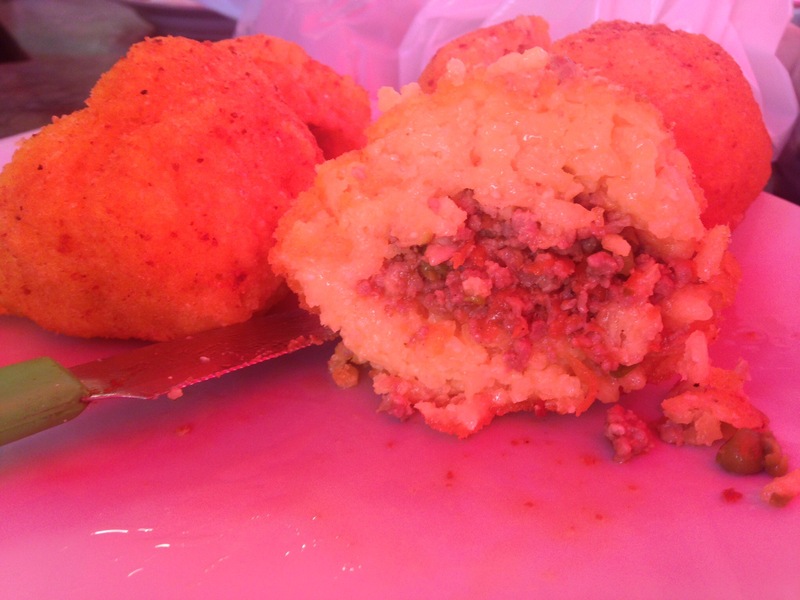 Arancini are rice balls famous in Sicily. 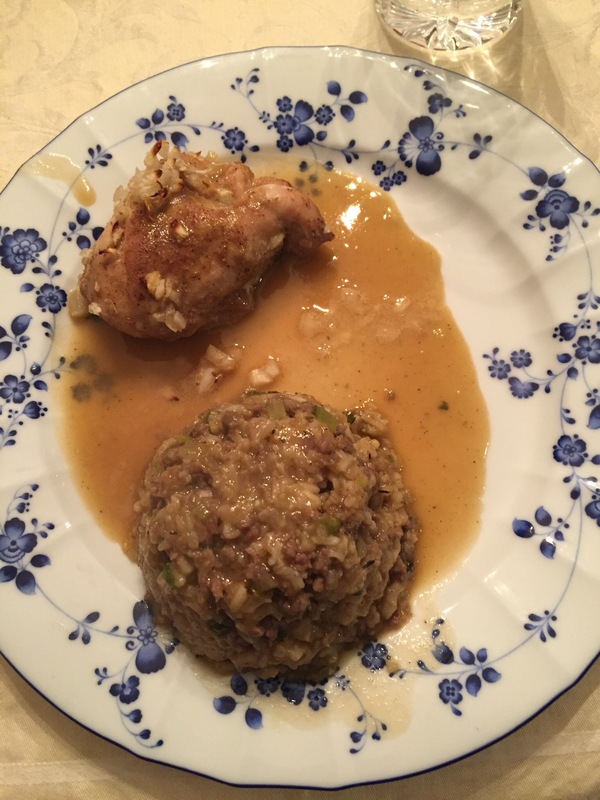 They are made from leftover rice and risotto. The center is traditionally filled with a bit of ham and cheese or a ragu of meat and vegetables. 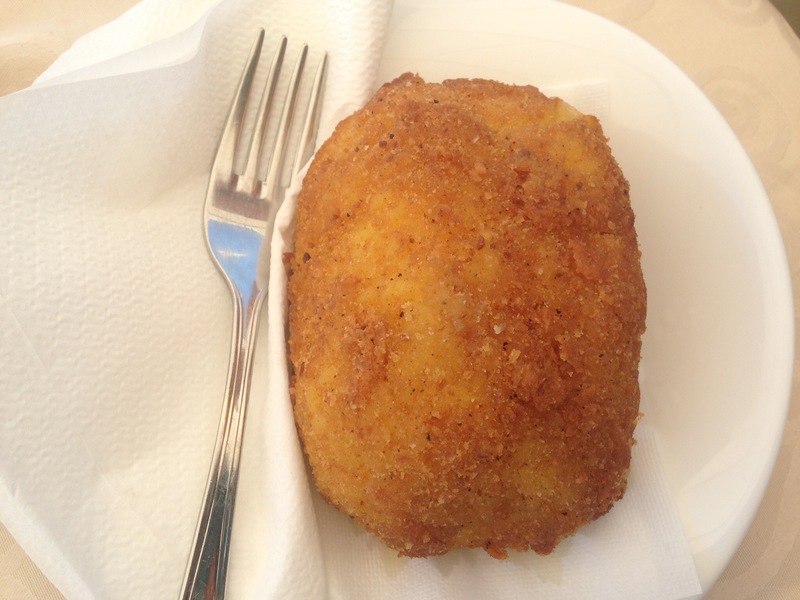 The large fist size balls are breaded and deep fried. It’s a fast food you can pick up at a take away or order at a restaurant . We tried the traditional and gourmet varieties in Sicily this past spring. The gourmet type can be filled with anything from shrimp to pistachio! 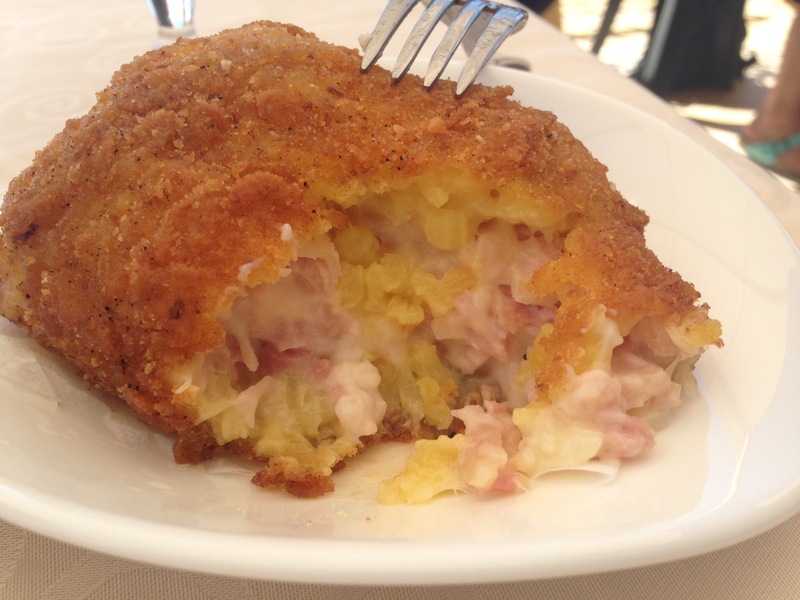 Arancini from Palermo filled with ham and melted soft cheese. Notice the saffron color of the rice. 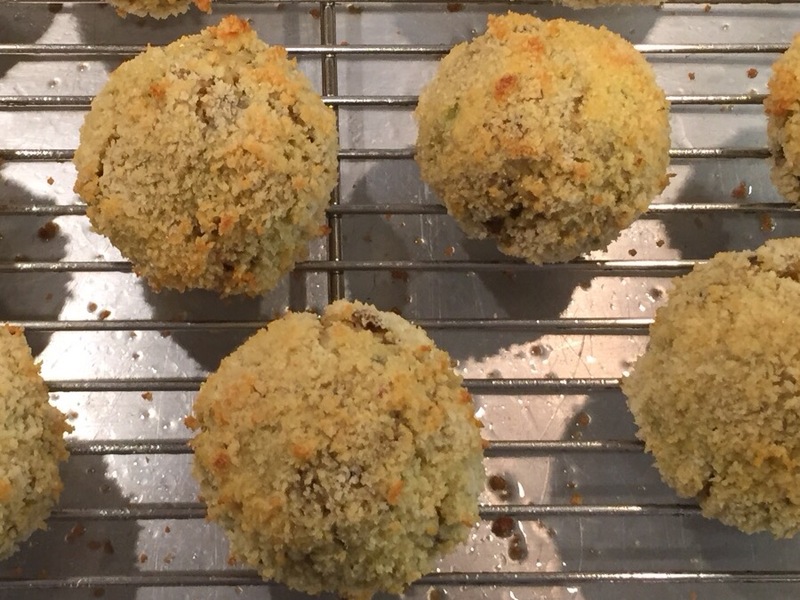 These Arancini are filled with a ground meat and vegetable ragù. 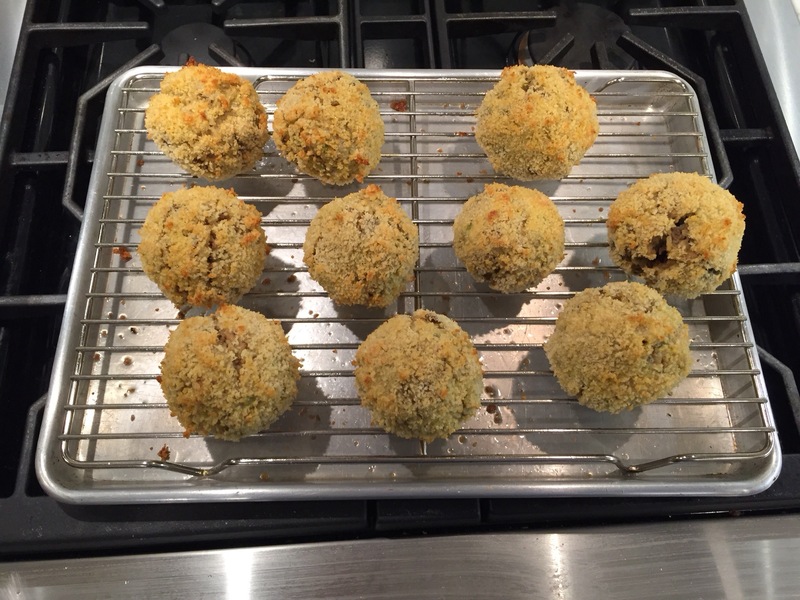 I made Cajun Dirty Rice this week and had a lot of leftovers, so my husband was inspired to make Arancini! 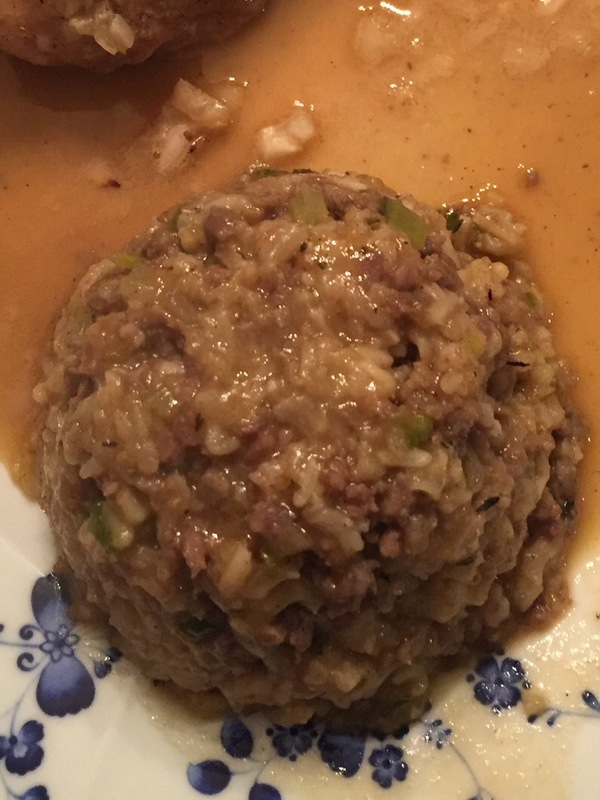 First he molded a snowball size ball of Dirty Rice by taking a handful of rice in one hand and then placing a tablespoon of chopped andouille sausage in the middle of it. Then he took another handful of rice to combine with the first to make a ball. 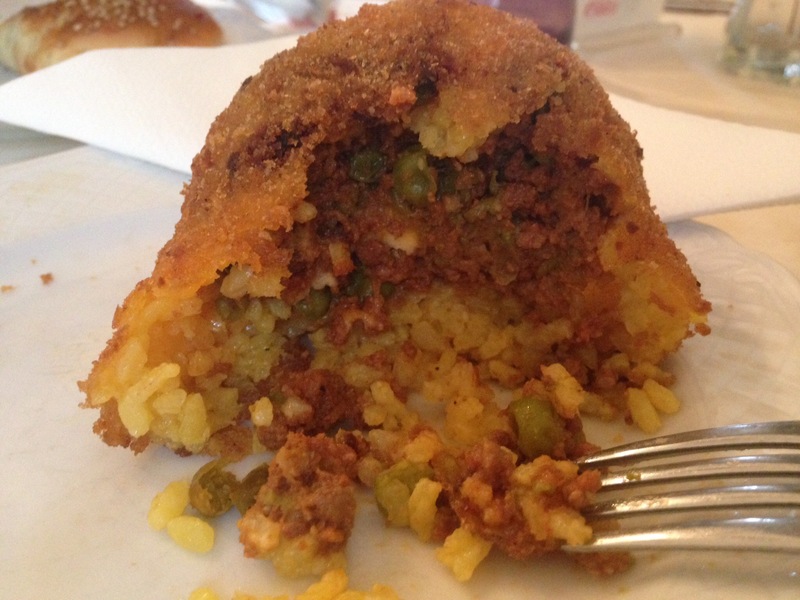 Posted in side dishes and tagged arancini, cajun arancini, leftover rice, rice balls, sicily. Bookmark the permalink. This is Dirty Rice, Baked Spicy Cajun Chicken and Gingersnap Gravy. 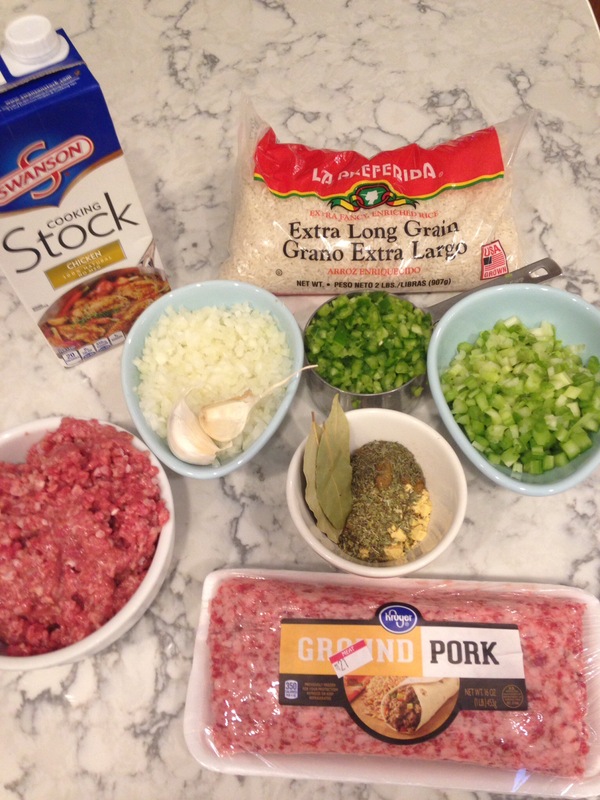 Dirty Rice is a Cajun recipe that Paul Prudhomme made famous with his spicy style of cooking! The Cajun people originated in southern France, emigrated to Nova Scotia in the early 1600’s, and settled in a colony that became known as Acadia. In the 1700’s the British drove them out and many migrated to Louisiana where they were well received by the French population there. Many settled along waterways and became farmers, trappers and fishermen. Chef Prudhomme developed his skills and shared his love of Cajun food with the world. So what’s the difference between Creole and Cajun cooking? Both cuisines were based on the use of local fresh products. Creole originated in New Orleans and is a mixture of the traditions of French, Spanish, Italian, American Indian, African and other ethnic groups. Cajun is very old French country cooking which began in France, moved to Nova Scotia and then came to Louisiana. Creole is more sophisticated and complex than Cajun. It’s city cooking. Creole cooking was prepared by the cooks and servants for the changing aristocracy of New Orleans. Cajun was prepared by country folks for their own families. Paul Prudhommes recipes usually have a seasoning mix. My recipe is 1/3 the salt, cayenne and black pepper he uses. I like hot spicy food, but Paul’s heat is too much for me. Our Louisiana friends tell us the Cajun food does not have as much heat as Prudhommes. 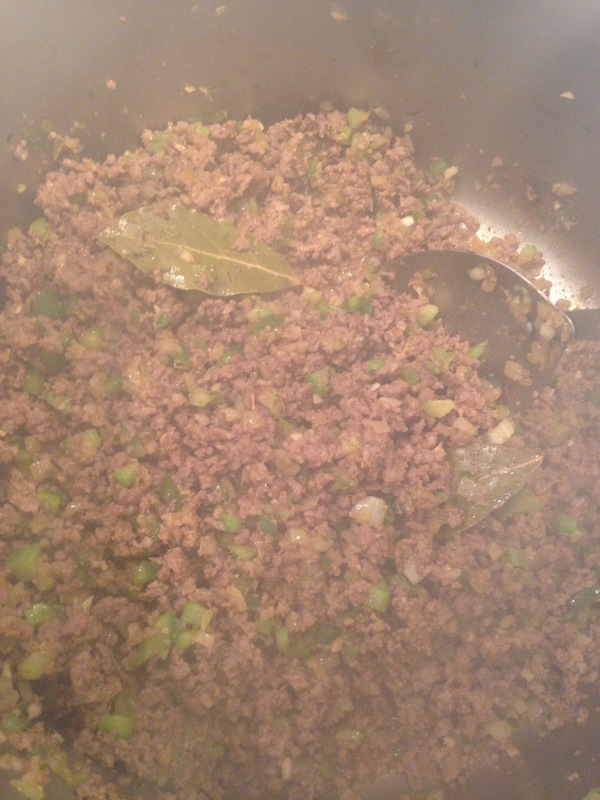 Cook and stir until meat in thoroughly browned and broken up into tiny pieces with your spoon, about 8 minutes. Reduce to medium heat. Cook and stir 10 minutes. 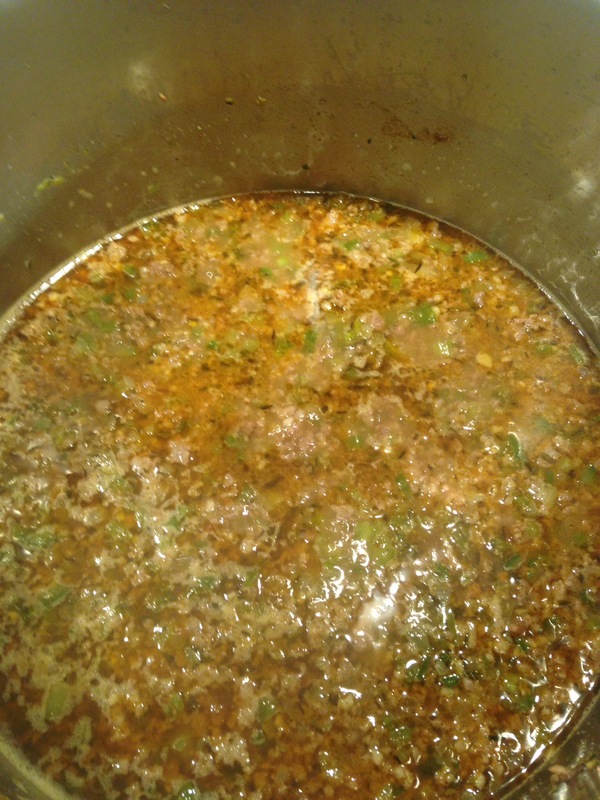 Add 4 cups chicken stock and simmer with the lid partly on, about 10 minutes. 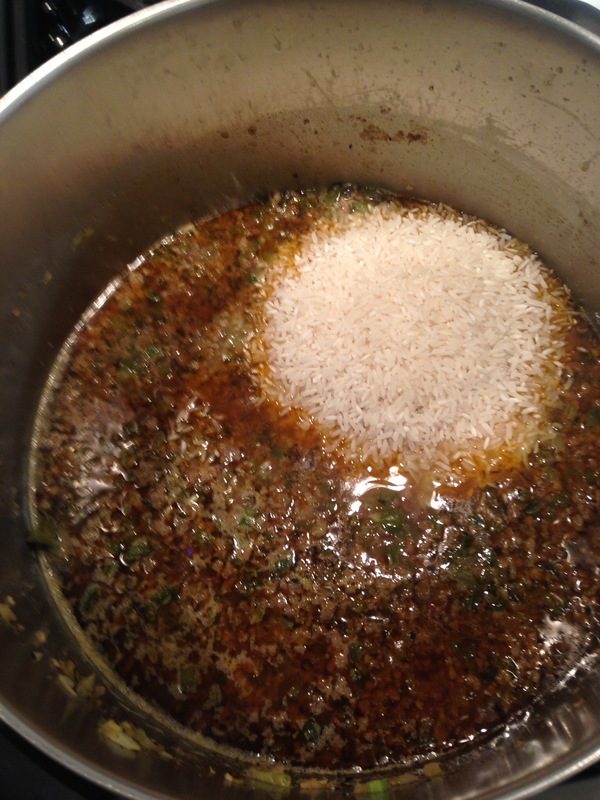 Add 1 and 1/2 cups uncooked rice. 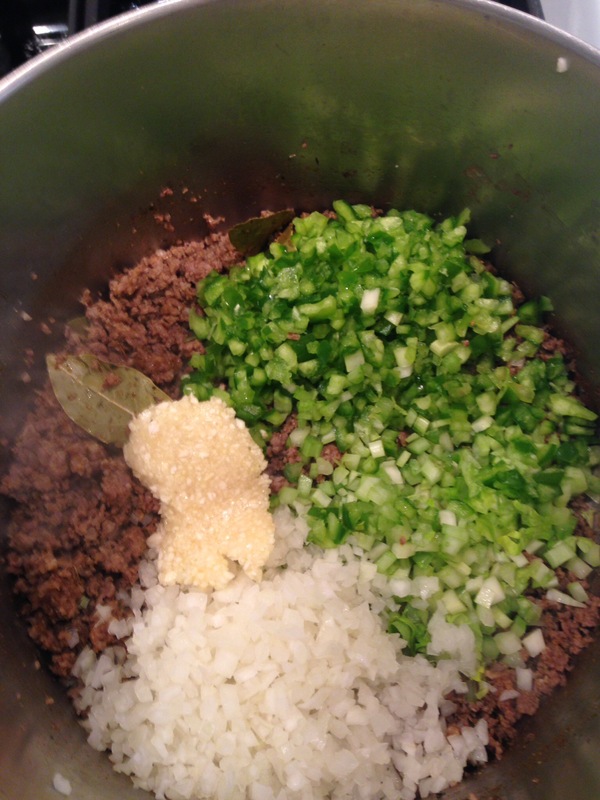 Stir, cover and reduce to the lowest heat possible. Cook 5 minutes. 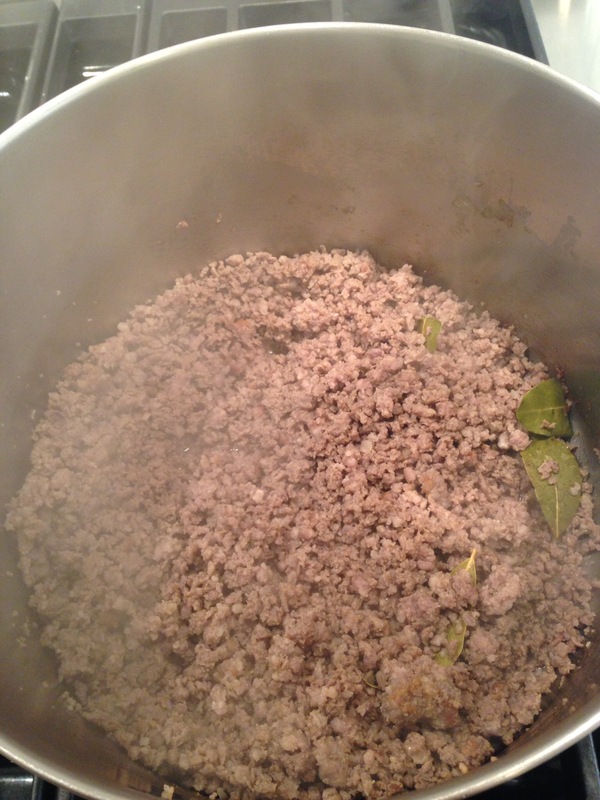 Remove from heat and keep covered 10 minutes or until rice is done. Posted in side dishes and tagged cajun, dirty rice, gizzards, Paul Prudhomme, rice. Bookmark the permalink.